The Annapurna Circuit Yoga Trek is a classic trek around the Annapurna, one of the most famous mountains in the world. This trek is renowned for the unrivalled diversity of landscapes and cultures transversed, and offers a formidable challenge due to high altitude. It has a duration of 13 days. This classic trek around the Annapurna, the world’s tenth-highest mountain and one of the most famous Himalayan giants, is one of the most diverse in terms of landscapes, altitude, and cultures: trekking through the three different regions of Lamjung, Manang and Mustang, you will experience a variety of cultures and all types of scenery Nepal has to offer. Altitudes on this trek vary between 800m at the beginning of the trek to 5,416m at Thorung La, one of the highest passes in the world, originally used by locals as a trade route, and a formidable challenge for any trekker. 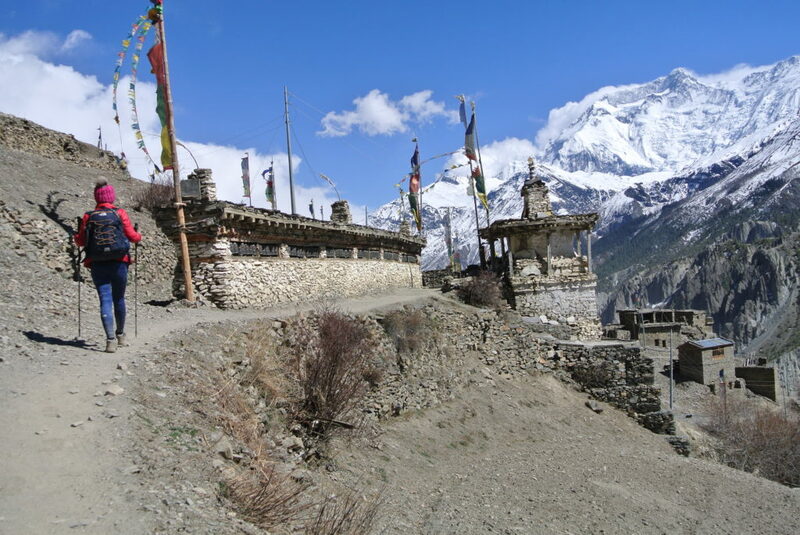 Thorung La offers spectacular views of the Annapurna range and smaller ranges northwards into Tibet. This trek also includes the holy village of Muktinath and old Buddhist monasteries in Kagbeni, Marpha and Jharkot. The journey ends in Jomsom, from where we fly back to Pokhara. After yoga and breakfast we drive to Besisahar. Gentle walk through some forest to Bhulbhule. Today’s walk offers a short and relatively easy day, allowing us to adjust to the experience of trekking in Nepal. Today the trail drops steeply to Syange at 1,070m from Bahundanda crossing the Marshyangdi River on a suspension bridge. We then follow the river to the stone village of Jagat or before climbing through forest to Chyamje at 1,400m. The day begins with the rocky trail following the Marshyangdi Rivers steadily uphill to Tal at 1,675m, the first village in the Manang district. We make a trailverse crossing a wide, flat valley and stay at a colorful village of Tal. The trail continues through a wide flat valley and then climbs up and down stone stairways until we reach to Dharapani at 1,890m. There we find a stone entrance chorten typical of the Tibetan influenced villages from here northwards. Often rough and rocky, the trail climbs to Tyanja at 2,360m and then continues through forest, but near the river, to Kopar at 2,590m. As we reach Chame, the headquarters of the Manang district, we are rewarded by the fine views of Annapurna II and two small hot springs by the town. The day starts through deep forest in a steep and narrow valley, crossing rivers on long bridges at 2,910m and 3,040m, and admiring the view of Paungda Danda rock face. From there the trail climbs to Pisang, where we have the choice of staying at Lower Pisang (better accommodation but less mountain view) or climbing an extra hour on a steep trail to reach Higher Pisang with more basic facilities but better mountain views. Today we continue through the drier upper part of the Manang district, cut off from the full effect of the monsoon by the Annapurna Range. People of this region herd yaks & raise crops for part of the year and they also continue to enjoy special trading rights gained back in 1784. Leaving Pisang, we have an alternate trails north and south of the Marshyangdi River which meet up again at Mungji. The southern route by Hongde, with its airstrip, at 3,325m involves less climbing than the northern route via Ghyaru, though there are better views on the trail that follows the northern bank of the river. From Mungji, the trail continues past the picturesque but partially hidden village of Bryanga at 3,475m to nearby Manang at 3,500m. Today we spend a day acclimatizing in Manang. We may undertake walks in the area, enjoying the magnificent views around the village. At the end of the day, we return back to our accommodation & have a good night’s rest. The trail climbs gradually towards Yak Kharka, leaving the Marshyangdi Valley, and continuing along the Jarsang Khola Valley. At Yak Kharka (4,030m), we notice that vegetation is steadily getting more sparse. We spend the night in Yak Kharka or continue to Ledar at 4250m and stay there. The trail descends to cross the river at 4,310m and then climbs up to Thorong Phedi at 4,420m/14,500ft. We have a choice to either stay overnight here and start very early the next morning or to continue for another 45min to the High Camp at 4,880m – this will depend on the group as it is colder up there and more difficult to sleep due to higher altitude. A very early start to a long day, made more challenging by altitude and sometimes snow. Climbing to the top of the pass marked by with magnificent views and prayer flags and chortens takes 3-4 hours. From there, we follow the path down to the holy village of Muktinath, taking about 4-5 hours. This is an easy day walking back to Jomsom, but can be tedious if we are unlucky to get the strong winds. From Muktinath to Jomsom, you will see the people of Mustang, a restricted area to the north, who come to sell handicrafts to pilgrims. We will pass some ancient caves and see the impressive White Mountain that is the Dhaulagiri. We take a morning flight back to Pokhara. In case that flight is cancelled due to bad weather, we have the option to drive down using local jeeps and buses (8-9hr drive). NOTE: Occasionally the flight back from Jomsom is cancelled due to bad weather. In this case we would try to fly back to Pokhara on the morning of the next day. Our program ends on day 13 of the itinerary however our staff will look after you until you get back to Pokhara. In case of delays in Jomsom past Day 13 of the itinerary, any extra costs for accommodation and food will need to be covered by the guest.